A regular breeding resident and migrant; an increasing number of loons appear to be late migrants lingering in Minnesota through early- to mid-December. There are a few reports of overwintering birds as well. The Common Loon was a common species during the Minnesota Breeding Bird Atlas (MNBBA). While the Common Loon is largely restricted to the boreal forests of Canada and Alaska, its breeding range also extends into the northern tier of the United States from the Pacific Northwest east to New England. Although Minnesota supports the largest U.S. breeding population south of Alaska (Figure 1), the centers of greatest abundance are found in Canada, especially in British Columbia, the Northwest Territories, Ontario, and Quebec. Figure 1 depicts the species relative abundance in the area best surveyed by the federal Breeding Bird Survey in southern Canada and the northern United States. Assigned a Continental Concern Score of 9/20 by Partners in Flight and designated a species of Moderate Concern by the North American Waterbird Conservation Plan. The Minnesota Department of Natural Resources has designated the Common Loon a Species in Greatest Conservation Need. Officially recognized as Minnesota’s state bird since 1961. A medium-distance migrant; winters are spent in the coastal waters of North and Central America. Primarily small fish, secured by diving and swimming under water. A mound of grasses, twigs, and aquatic vegetation placed on the ground near the lakeshore and often on an island. Breeding distribution and relative abundance of the Common Loon in North America based on the federal Breeding Bird Survey, 2011–2015 (Sauer et al. 2017). Long considered the most iconic symbol of Minnesota’s northern wilderness, the Common Loon was actually a common resident of lakes throughout the state in the late 1800s and early 1900s. Hatch (1892) referenced the species’ abundance when he came to Minnesota in 1858, noting some of its favorite haunts near White Bear Lake, Waseca, and Minnetonka, where the species was frequently shot for sport. Roberts (1932) would later describe it as a common breeding resident throughout the state. Although it was less common in the prairie grassland regions of western Minnesota, confirmed nesting records (nests with eggs) were available from Jackson County in the southwest corner of the state, north through the prairie-forest border counties of Otter Tail and Becker, and onward to the Aspen Parklands of Polk County in the far northwest. Farther east, confirmed records were available from Hennepin (Minneapolis), McLeod, and Meeker Counties; inferred nesting records (nests, immature birds) were available from Isanti and Sherburne Counties and from Itasca State Park. Despite the Common Loon’s apparent statewide distribution, Roberts noted that numbers had declined considerably in the 40 years since Hatch first described it as abundant, due largely, as Hatch had commented, to the popularity of shooting the bird for mere sport. If the Common Loon was indeed as widely distributed as Hatch and Roberts alleged, its range had retreated northward by the time that Green and Janssen prepared an updated account of its status in 1975; similar changes were noted in other states on the southern edge of the species’ range, including Wisconsin, Michigan, Ohio, and Pennsylvania (Evers et al. 2010). Largely absent from counties south of the Minnesota River, the species was confined to the forested counties of central and northern Minnesota by the early 1970s. Little had changed when Janssen provided another updated account in 1987 and delineated 32 northern counties where nesting had been confirmed since 1970. The only county south of the Minnesota River with confirmed nesting was Scott in the western Twin Cities metropolitan region. Hertzel and Janssen (1998) would later add an additional 6 counties to the list, all north of the Minnesota River. Although the Common Loon’s population appeared relatively stable, increased recreational activity and shoreline development on Minnesota’s northern lakes began to raise concern about the potential impacts on Minnesota’s state bird. Significant die-offs of migrants congregating on Lake Michigan due to botulism poisoning during the falls of 1963, 1964, and 1965 added to the concern (Fay 1966). Then, in 1966, a field biologist who spent four months canoeing in the Boundary Waters Canoe Area Wilderness failed to observe a single young chick (Ream 1976). These concerns, coupled with widespread public interest in the species, prompted the initiation of numerous studies across the state. Many efforts focused on understanding the impacts of recreational activity on nest site selection and productivity (McIntyre 1975; Ream 1976; Titus and VanDruff 1981; Valley 1987; Tischler 2001). Other studies focused on assessing regional and statewide population numbers (Hirsch and Henderson 1980; Mooty and Goodermote 1985; Mooty and Perry 1988; Mathisen 1988; McIntyre 1978, 1988; Strong and Baker 2000; Larson 2016). Today, the Common Loon is one of the most well-studied members of Minnesota’s breeding avifauna. In-depth studies have been conducted in the Boundary Waters Canoe Area Wilderness (Olson and Marshall 1952; Ream 1976; Titus and VanDruff 1981), Voyageurs National Park (Reiser 1988; Paruk et al. 2008), Itasca State Park (McIntyre 1975), and the Whitefish chain of lakes in north-central Minnesota (Valley 1987; Tischler 2001). Although at least one study demonstrated a local population decline over a 15-year interval from 1971 to 1986 (McIntyre 1988), the overwhelming conclusion of these diverse studies was that the Common Loon is an adaptable species that has maintained a stable and healthy population in Minnesota for several decades. MNBBA participants reported 2,856 Common Loon records in 30.9% (1,528/4,941) of the surveyed atlas blocks and in 28.5% (666/2,337) of the priority blocks. Breeding evidence was gathered in 762 (15.4%) of the surveyed blocks (Figures 2 and 3; Table 1). The species was observed in 56 of Minnesota’s 87 counties and was documented breeding in 41 counties; 1 block where breeding was documented straddled 2 different counties (Scott and Dakota). This latter record was the only one located south of the Minnesota River. However, “probable” breeding records were recorded in 2 southern counties (Lyon and Sibley) and “possible” breeding records were recorded in 4 southern counties (Murray, Wabasha, Waseca, and Watonwan). Six of the counties where nesting was confirmed were not documented previously by Hertzel and Janssen (1998): Carlton, Dakota, Mille Lacs, Pine, Polk, and Swift. Detections on MNBBA point counts were coupled with data on habitat, landscape context, and climate to generate a map of suitable Common Loon habitat in Minnesota (Figure 4). Sites with the highest suitability are located in the Laurentian Mixed Forest Province and the northern region of the Eastern Broadleaf Forest Province. Nevertheless, scattered sites are also predicted to occur throughout south-central and southwestern Minnesota and along the Mississippi River valley. Although the Common Loon has apparently retreated from the southern counties where it may have been an uncommon resident in the early twentieth century, its distribution has remained relatively stable over the past 50 years. Comparison of the map of breeding season locations identified by the Minnesota Biological Survey (MBS) with the MNBBA distribution map actually suggests that the species has become more common in the Twin Cities metropolitan region in the past 20 years. In Anoka, Hennepin, Ramsey, Scott, Washington, and Wright Counties, records from the MNBBA were far more abundant than records from the MBS (Minnesota Department of Natural Resources 2016). The same was true, though to a smaller degree, in northwestern Minnesota. As noted earlier, populations retreated elsewhere along the southern edge of the loon’s breeding range in areas where residential and agricultural development changed the landscape. Reports in the late twentieth century, however, suggested that recolonization of some of these areas may be underway in the northeastern United States (Evers et al. 2010). During its second breeding bird atlas, Ontario documented a small expansion in the Common Loon’s distribution in the southeastern region of the province (Cadman et al. 2007) and Michigan documented an increase in nesting reports along the southern edge of the species’ breeding distribution in the Lower Peninsula (Chartier et al. 2013). Breeding distribution of the Common Loon in Minnesota based on the Breeding Bird Atlas (2009 – 2013). Summary statistics of observations by breeding status category for the Common Loon in Minnesota based on all blocks (each 5 km x 5 km) surveyed during the Breeding Bird Atlas (2009-2013). Summary statistics for the Common Loon observations by breeding status category for all blocks and priority blocks (each 5 km x 5 km) surveyed during the Minnesota Breeding Bird Atlas (2009-2013). Landcover suitability of the Common Loon in Minnesota based on habitat, landscape context, and climate data gathered during the Minnesota Breeding Bird Atlas (2009-2013) using the MaxEnt modeling approach. Often referred to as an indicator of Minnesota’s northern wilderness, the Common Loon was considered to prefer a deep, clear, freshwater lake remote from human disturbance, dotted with numerous islands, and bounded by an irregular, rocky shoreline (Figure 5). Judy McIntyre, a well-known researcher who spent many years studying loons in Minnesota in the 1970s, described the species’ breeding season requirements in a similar fashion. Large clear-water lakes that average between 20 and 80 hectares (ha) in size and that provide an abundance of small fish, suitable nesting sites, and a shallow, protected location to serve as a nursery for young chicks were deemed critical (McIntyre 1986). Large lakes in particular seemed to be a prerequisite; the large-bodied Common Loon needs a long runway for its labored takeoff from the water’s surface before gaining enough altitude to clear the shoreline’s trees. Because the species is dependent on its eyesight to capture and dive after prey, water clarity was considered equally important. Many biologists also believed minimal human disturbance to be critical to the Common Loon’s reproductive success. Yet as the years passed and more field studies were conducted, biologists learned that the species’ habitat requirements are far more complex and variable than was once thought. Indeed, the land of 10,000 lakes (actually 11,842 lakes larger than 4 ha in size) proved the perfect testing ground to validate the species’ dependence on large lakes. Several studies had noted the species would occasionally use lakes smaller than 20 ha in size. Data collected by the MNDNR Volunteer LoonWatcher Survey, for example, included 5 reports of the Common Loon successfully nesting on lakes as small as 5 to 8 ha (Perry and Woizeschke 2000). These observations prompted a more in-depth study of lake occupancy in north-central Crow Wing County during the summers of 1988 and 1989. The results clearly demonstrated the importance of small lakes to Minnesota’s Common Loon population. Nearly 35% of the lakes that were 4–10 ha in size had at least one loon present (Perry and Woizeschke 2000). Another broader analysis conducted in 1989 throughout the state found that 30% of the lakes that were 4–20 ha in size were occupied by at least one loon; statewide, those lakes supported 32% of Minnesota’s Common Loon population (Strong and Baker 2000). Other studies have shown that loons occupying small lakes usually defend territories that embrace multiple lakes, presumably to provide access to more foraging sites (Olson and Marshall 1952; Miller and Dring 1988; Piper et al. 1997). Many of these smaller lakes also are embedded in a landscape fragmented with scattered woodlands and farmlands. As a result, the lakes are often more eutrophic than those located further north on the Canadian Shield. More than half of the nests found within the Whitefish chain of lakes were located on cattail hummocks along a lake’s shallow, marshy shoreline (Tischler 2001). As the species’ breeding range began to retreat northward, concern increased about possible deleterious impacts of elevated water-based recreational activities and shoreline development on the species. Detailed studies in Minnesota and elsewhere have shown mixed results in this regard. Valley (1987), for example, showed a significant correlation between recreational disturbance and hatching success along the Whitefish chain of lakes in north-central Minnesota, while most analyses in the Boundary Waters Canoe Area Wilderness (BWCAW) by Titus and VanDruff (1981) showed little impact on productivity. In the BWCAW, recreational activity increased 800%–900% from 1950 to 1976, while the adult loon population actually increased 35% (Titus and VanDruff 1981). Despite increases in lakeshore development, including an estimated 500% increase in seasonal housing units in the state’s northern counties from 1990 to 2000, Minnesota’s loon population has remained relatively stable (Freshwater Society 2007). However, a study in Wisconsin demonstrated that although the Common Loon may adapt to high levels of recreational disturbance, territorial loons were either absent from the lake or not reproductively successful when the density of shoreline buildings exceeded 25 buildings per km (Meyer 2006). Although many suspected issues affecting the Common Loon have proven to be more variable than originally thought, water clarity remains a particularly important feature for this visual predator. The Minnesota Loon Monitoring Program has shown a significant correlation between water clarity and the number of adult loons, the number of juvenile loons, and the number of loons per acre (Larson 2016). As water clarity increases, so do each of these metrics. Typical breeding habitat of the Common Loon in Minnesota (© Lee A. Pfannmuller). The North American breeding population is estimated at 252,000 to 264,000 territorial pairs; the number of nonbreeding birds raises the estimate for the total adult population to approximately 607,000 to 635,000 birds (Evers et al. 2010). Of these birds, approximately 29,500 to 37,000 adults can be found in the United States. In Minnesota, a statistically robust statewide survey was conducted during the 1989 breeding season: the survey estimated the state’s total adult population at 10,355 to 12,897 individuals (Strong and Baker 2000), or approximately 1.7% to 2.0% of the North American population. Following the 1989 survey, the MNDNR launched its volunteer Minnesota Loon Monitoring Program in 1994, which focused on monitoring the Common Loon in six 100-lake regions, or index areas. Each area was selected to represent different regions of the species’ statewide breeding distribution. This volunteer-based program engages nearly 1,000 citizen scientists, who visit each of the 600 lakes for one morning during a 10-day period in late June or early July every year and report the number of loons observed. The 2015 breeding season represented the twenty-second field season of the survey. Since 1994, the survey demonstrates that the Common Loon’s population has remained relatively stable within the index areas. Across all 6 index areas, each region shows an average of 2 adults per 40 ha of lake, varying from a low of 0.5–1.2 adult loons per 40 ha in the Kandiyohi index area to a high of 2.8–4.7 adult loons per 40 ha in the Itasca index area. Overall, an average of 66% of monitored lakes report detections of the Common Loon (Larson 2016). Minnesota’s stable population trend is similar to that reported throughout much of the species’ breeding range (Evers et al. 2010). Although the federal Breeding Bird Survey (BBS) is not considered a reliable tool for monitoring Common Loon populations throughout the species’ range (Evers et al. 2010), these data are statistically reliable in Minnesota where the species is common, widespread, and encountered frequently enough along BBS routes to result in a statistically robust trend line. Indeed, Minnesota is the only state where the average number of loons detected per BBS route each year is a little higher than 1 (1.09). 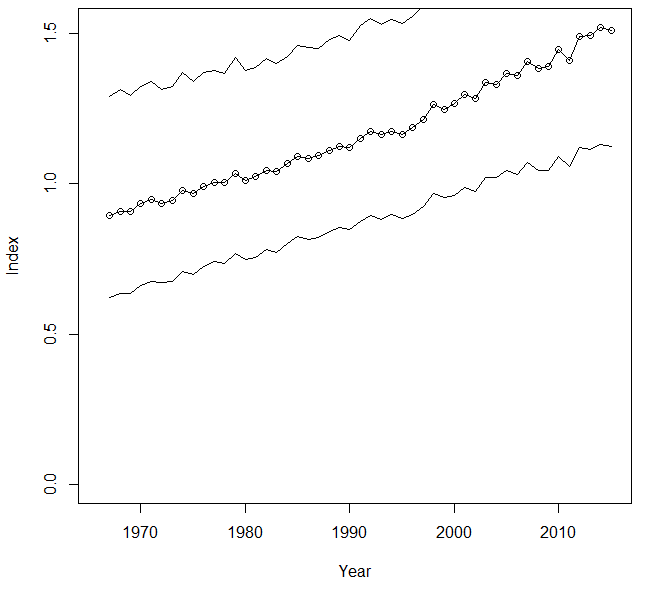 Minnesota BBS data actually demonstrate a significant annual increase of 1.11% per year from 1967 to 2015 (Figure 6) (Sauer et al. 2017). Similar increases are seen throughout the United States and Canada. Although the statewide population trends are different for the BBS and MNDNR surveys, the good news is that Minnesota’s Common Loon population is at least stable, and more likely even increasing. The statewide BBS may better reflect the species recolonization of portions of its former breeding range in the state, especially in east-central Minnesota, an area not included in the 6 index areas delineated by the MNDNR survey. Breeding population trend for the Common Loon in Minnesota for 1967–2015 based on the federal Breeding Bird Survey (Sauer et al. 2017). An iconic symbol of the northern wilderness, the Common Loon has been assigned a Continental Concern Score of 9/20 (Partners in Flight 2017) and designated a species of Moderate Concern by the North American Waterbird Conservation Plan (2006). It is not federally listed but has been officially classified as a Threatened or Special Concern Species by several states, including Michigan, (Evers et al. 2010). In Minnesota the loon was officially designated the state bird in 1961 and was designated a Species in Greatest Conservation Need by the Minnesota Department of Natural Resources (2015). Regionally, it is recognized as a Stewardship Priority by the Upper Mississippi River & Great Lakes Region Joint Venture. Although sport hunting was considered a major mortality factor for the Common Loon in the United States nearly a century ago, largely because of the species’ perceived threat to sport fishing, today’s threats to the Common Loon are complex and wide-ranging. Mortality from botulism and other diseases, particularly in areas where large numbers of birds congregate during migration or in the winter, pose an ongoing risk. As recently as 2012 an estimated 3,000 loons died from botulism poisoning on Lake Michigan, where the species congregates each fall before migrating to its wintering grounds along the Atlantic Coast and the Gulf of Mexico (Taylor 2013). This was not a rare one-time occurrence. Between 1999 and 2009, a total of 24,000 loons died from botulism on Lake Michigan (Porter 2013). Climate change also poses a threat to this water-dependent species. Warmer temperatures, for example, could negatively impact the coastal fish resources that the Common Loon depends on during the nonbreeding season (Evers et al. 2010). Indeed, a comprehensive modeling exercise conducted by the National Audubon Society recently predicted that the species could lose nearly 56% of its current summer range and 75% of its winter range by the year 2080, potentially forcing the species even farther north (Langham et al. 2015; National Audubon Society 2016). As a result of the analysis, the species was classified as “climate endangered”. A long-lived species high on the food chain, the Common Loon is vulnerable to a host of environmental contaminants. One of the most thoroughly studied contaminants is mercury, which reaches northern lakes through atmospheric deposition. Present in all levels of the aquatic food chain, the Common Loon’s fish-based diet can, over time, result in deadly levels of mercury that impact the bird’s behavior and survival. Birds with high blood-mercury levels, for example, spend less time incubating their eggs (Evers et al. 2010). Equally dangerous is the direct ingestion of lead fishing sinkers, consumed when birds are searching lake bottoms for small pebbles to aid their digestion. One study in New England documented that lead poisoning was responsible for 44% of the dead loons collected over a 14-year period (Sidor et al. 2003). Finally, all birds that spend a portion of their lives on coastal waters are susceptible to the impacts of oil spills. The extent of the threat was magnified by the 2010 Deepwater Horizon oil spill in the Gulf of Mexico. Between April 22 and July 15, 2010, an estimated 210 million gallons of oil gushed from the ocean floor, creating an oil slick that extended thousands of square miles and polluted nearly 1,100 miles of shoreline. To combat the spill, another 800,000 to 1 million gallons of toxic dispersant chemicals were also released into the Gulf waters (Weflen 2013; Bylander and Grumney 2015; Pallardy 2016). Critical habitat for Minnesota’s Common Loons is provided in the Gulf of Mexico, where nearly 85% spend the winter (Kennedy 2016). Adults migrate to the coast each fall, returning to their claimed territories each spring to breed. Juveniles, on the other hand, remain along the coast for up to three years before returning north; many will not breed until they are nearly six years old (Evers at el. 2010). At least 200 loons in the Gulf were killed directly by the Deepwater Horizon oil spill; the number of Minnesota birds that perished is unknown (Bylander and Grumney 2015). Although it is a significant one-time loss, the long-term impact of directly ingesting oil and oil dispersants, or of ingesting other aquatic organisms impacted by these contaminants, remains unclear. Assessing these potential impacts is the focus of a comprehensive investigation conducted by the Minnesota Department of Natural Resources, the University of Connecticut, and the U.S. Geological Survey. Underway for several years, the study has already detected traces of oil and oil dispersant in the blood, fat, feathers, and eggs of Minnesota loons (Bylander and Grumney 2015). Fay, L. D. 1966. “Type E Botulism in Great Lakes Water Birds.” Transactions of the North American Wildlife and Natural Resources Conference 31: 139–149. Mathisen, John E. 1988. Report on Results of Monitoring of Common Loons Done in 1988 on the Chippewa National Forest. Cass Lake, MN: Chippewa National Forest. McIntyre, Judy W. 1975. “Biology and Behavior of the Common Loon (Gavia immer) with Reference to its Adaptability in a Man-Altered Environment.” Phd diss., University of Minnesota. McIntyre, Judy W. 1978. “The Common Loon: Part III: Population in Itasca State Park Minnesota 1957–1976.” Loon 50: 38–44. McIntyre, Judy W. 1986. “Common Loon.” In Audubon Wildlife Report 1986, edited by Roger L. di Silvestro, 679–695. New York: National Audubon Society. McIntyre, Judy W. 1988. “The Minnesota Report: A 15 Year Survey Comparison.” In Papers from the 1987 Conference on Loon Research and Management, edited by Paul I. V. Strong, 118–130. Meredith, NH: North American Loon Fund. Miller, E., and T. Dring. 1988. "Territorial Defense of Multiple Lakes by Common Loons: A Preliminary Report." In Papers from the 1987 Conference on Loon Research and Management, edited by Paul I. V. Strong, 1–14. Meredith, NH: North American Loon Fund. Mooty, Jack J., and Donald L. Goodermote. 1985. “Common Loon Numbers in the Knife Lake Area – Boundary Waters Canoe Area Wilderness.” Loon 57: 12–14. Mooty, Jack J., and Pamela Skoog Perry. 1988. Common Loon Numbers in North-Central Minnesota. St. Paul: Minnesota Department of Natural Resources. Olson, Sigurd T., and William H. Marshall. 1952. The Common Loon in Minnesota. Minnesota Museum of Natural History Occasional Papers, no. 5. Minneapolis: Minnesota Museum of Natural History. Paruk, James D., A. Nelson, Lori Siegel, Jennifer Fox, Steve Windels, David Evers, and Cory Counard MacNulty. 2008. Effects of 2000 Rule Curve on the Reproductive Success of the Common Loon (Gavia immer) in Voyageurs National Park. Report to Voyageurs National Park. International Falls, MN: Voyageurs National Park. Piper, Walter H., James D. Paruk, David C. Evers, Michael W. Meyer, Karen B. Tischler, Margaret Klich, and Jerry J. Hartigan. 1997. “Local Movements of Color-Marked Common Loons.” Journal of Wildlife Management 61: 1253–1261. Porter, Adele. 2013. “Flying With the Loons.” Minnesota Conservation Volunteer 76(Jan/Feb): 8–19. Ream, Catherine H. 1976. “Loon Productivity, Human Disturbance, and Pesticide Residues in Northern Minnesota.” Wilson Bulletin 88: 427–432. Reiser, M. Hildegard. 1988. “Effects of Regulated Lake Levels on the Reproductive Success, Distribution and Abundance of the Aquatic Bird Community in Voyageurs National Park, Minnesota.” PhD diss., Northern Arizona University, Flagstaff. Sidor, Inga F., Mark A. Pokras, Andrew R. Major, Robert H. Poppenga, Kate M. Taylor, and Rose M. Miconi. 2003. “Mortality of Common Loons in New England, 1987 to 2000.” Journal of Wildlife Diseases 39: 306–315. Titus, James R., and Larry VanDruff. 1981. “Response of the Common Loon to Recreational Pressure in the Boundary Waters Canoe Area, Northeastern Minnesota.” Wildlife Monographs 79: 3–59. Valley, Paul J. 1987. “Common Loon Productivity and Nesting Requirements on the Whitefish Chain of Lakes in North-Central Minnesota.” Loon 59: 3–11. Weflen, Kathleen. 2013. “Travels with Gavia immer.” Minnesota Conservation Volunteer 76(Jan/Feb): 2–3.